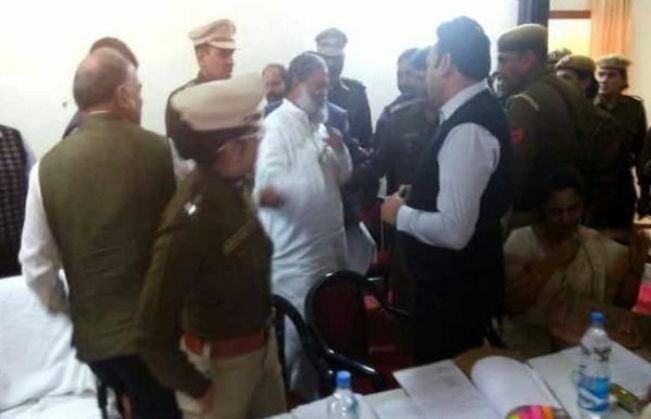 Sangeeta Kalia, the Suprintendent of Police of Fatehabad, Haryana, has been transferred after she had an argument with Haryana Health and Sports minister Anil Vij on 27 November. A video of the argument between Kalia and Vij went viral on the internet and the minister had to face a lot of criticism for his behaviour. Suspended IPS officer Amitabh Thakur also lauded her for 'keeping the dignity of the uniform intact'. Fatehabad SP Sangeeta Kalia who had a spat yesterday with Haryana Minister Anil Vij, transferred. According news reports, Vij was chairing the committee meeting on 27 November in Fatehabad, Haryana. The incident occurred during a discussion on the issue of liquor smuggling. Vij asked the woman officer Sangeeta Kalia what steps were being taken to curb the smuggling menace. The officer replied that most of the people arrested in these cases secured bail soon and went back to smuggling alcohol in the areas bordering Punjab. However, it is believed that Kalia's reply infuriated Vij who then got into an argument with her and questioned the "lack of action" in this regard. When Kalia objected, Vij started yelling at her to "get out". The officer said, "I will not go out. You cannot insult me like this." After this exchange, Vij left the meeting in a huff and apparently said that he would not return to Fatehabad for as long as Kalia was stationed in the district.